Ceredigion has something to suit everyone with magnificent coastlines; tranquil countryside; historic castles; picturesque fishing villages and traditional market towns. The name 'Ceredigion' means the land of Ceredig who was son of the Celtic cheiftain Cunedda. This takes Ceredigion back to 415AD and it is steeped in history and tradition. To relive some of this history you can visit the imposing Cilgerran Castle which is strategically situated on the steep gorge of the river Teifi. Cardigan Castle came into public ownership 13 years ago and has undergone extensive restoration and opened its doors to the public for the first time on 15th April 2015. Ceredigion's 50 mile coast line runs from Pembrokeshire's National Park in the south to Snowdonia in the north. Much of the coastline is designated Heritage Coast and it is dotted with small villages, ports and towns. There is a great deal of seafaring history around these coasts and its coves were used in the 18th century for smuggling. If you don't want to sunbathe on one of the many Seaside Award winning beaches you can walk along the rugged cliffs or take a boat trip to see some of the 130 resident bottlenose dolphins. Alternatively you could move inland to take in some of Wales' most beautiful landscapes. Several unique habitats are protected by local and national organisations, including the RSPB Reserve at Ynys-hir , the Natural Resources Wales nature reserves on the Dyfi Estuary and Cors Fochno plus Cors Caron around Tregaron. This part of Wales is Red kite Country. It is possible to watch Red Kites feeding at several sites including Bwlch Nant yr Arian Forest . Feeding is usually at 2:00 pm GMT. There are plenty of attractions to keep children amused too. A few miles north of Penbryn is the New Quay Honey Farm which produces a wide range of honey products and also has an extinsive and fascinating live bee exhibition at its visitor centre during the summer. In New Quay itself is the New Quay Reptile World where you can get close to a number of reptiles and even hold a selection of snakes. Slightly further away in Haverford West is the Wickedly Welsh Chocolate Factory . Here you can see chocolate being made by hand and have a go at making your own chocolate lollies, or relax in the chocolate deli and have a flavoured hot chocolate or try the chocolate kebab. The Vale of Rheidol Narrow Gauge Railway takes you to spectacular waterfalls at Devils Bridge or, a little closer to the cottage, you could take in the Teifi Valley Railway and the Cenarth Falls. For up-to-date information on what's on in and around Ceredigion see the local paper, The Tivy-Side Advertiser . Penbryn is not only a wonderful base from which you can discover the rest of Ceredigion, it is itself a beautiful place to explore. There are many footpaths through woodland, over cliffs or along valleys and beaches. 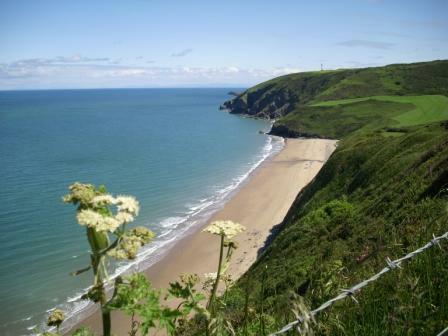 Penbryn beach is owned by the National Trust and along with some of its neighbouring beaches it has gained the Seaside Award in several years. The beach is popular in the summer months. Please note that dogs are not allowed onto the beach between May and September. 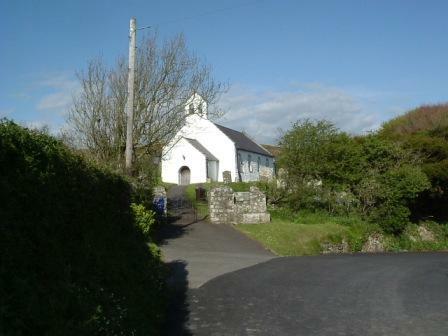 From the beach it is a stiff walk up the valley to Penbryn church which is well worth a visit. From the church there are beautiful views out to sea and back up the green valley. Spring and Autumn are wonderful times of year to visit Penbryn. In the spring the green fields are peppered with spring flowers and new-born lambs. The autumn brings a wealth of golden colours to the wooded hills and the heathered cliffs. The weather, which is always fickle on the west coast, is often sunnier than in the summer months.